Speedzilla Motorcycle Message Forums > General Motorcycle Discussion > The Lounge > Any rc8r riders on here ??? Any rc8r riders on here ??? 2005 RC51 Sato pipes, rear sets & Exhaust hangers,Penske Rear shock, Turn One air box & Snorkle, MR hugger, dash & front fender, Hotbodies undertail, proton flushmounts, carbon V cowl, Galfer lines, Scotts Filter, Heli Bars, PWR com III, Custom HID projector lights. But to be honest. It had an absolutely wonderful chassis. And the 2010 engine while being very abrupt and hasty with its torque application was an absolute dream once you understood what it wanted. I wanted one but AFAIK nobody here has one. RC8R Forum has a few ex member of this place on it. here's mine just before it got stripped down, parted out and put back to stock. WIBBLY I think we have chatted on the RC5q site a couple times? What did you have trouble with on your RC8R? I still have my RC51 but really loving the RC8R. Hope you are well!! I suspect it was a bad casting in the case that caused a misalignment. KTM also have a retarded seal system. Instead of the mechanical seals riding on the pump shaft, they are on a wear bushing that is sealed with an oring. I have no idea why they would do that. An electric water pump wouldn't work with the rc8. The suction to the pump comes from inside the cases, not a hose. I'm wondering if it is the supplier. 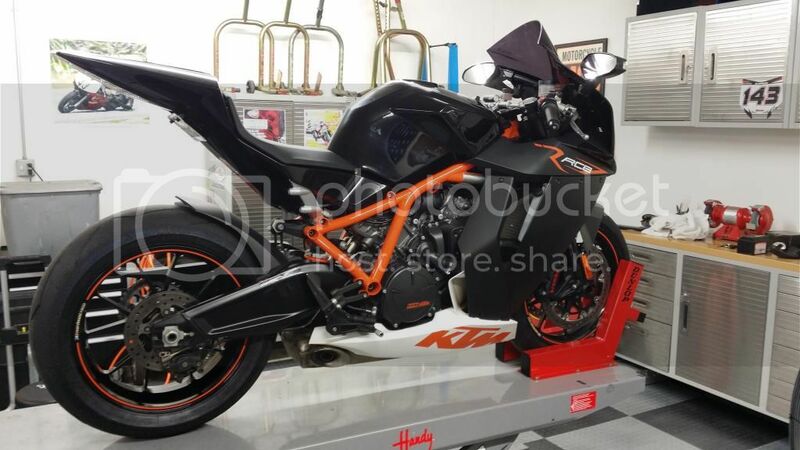 KTM had a bad run of water pumps and fuel pumps on the 950ADV and SE. Advrider might help out in the OC section. I bought one back in October. I got a really good deal on a used 2012 model. I haven't had much of a chance to ride it though because of the weather. It's not a Honda in that I think it will be more fiddly to maintain, but probably not near as bad as a Ducati. At least I have a local dealer and reasonable access to parts. No, I didn't get rid of any of my Hondas either. I'm getting the mods ready that I want to make to it this Spring. I have a Rottweiler Ram Air and SAS removal kit and I'm having ECUnleashed reflash the ecu. Had nothing but problems with mine. Finally blew the engine and parted it out. Dropped a valve and the engine was toast. ^^ And this guy can keep Aprilia SXV's running. I have a 2012 model and haven't had any major issues with it, but only have about 5000 pretty easy miles on it. Made the RC51 into a track bike years ago so that one takes the abuse but keeps ticking. The only issue with the RC8R is a slight glitch at around 5000 rpm. I'm building the map in the pcv with dual auto tune and it seems to be helping a little. Power commander has a new product to analyze data called the POD-300. Has anyone on here used this yet?